– What are the assumptions we hold about the trajectories towards higher education for undocumented students? – How do we, as educators, navigate the conflict between supporting our students’ educational futures and the realities of the obstacles they will and continue to face? There are many students who work hard throughout their school years in hopes of one day attending their dream college to attain their dream careers. Many of such students do not find out they are undocumented until it comes to the “citizenship” section of the college application. With a day left before applications are due, the student is lost and confused. Even if they become accepted into the school, they will most often be unable to finance the tuition, leaving them lost and confused once again. It is imperative that every undocumented student be prepared to handle the complicated situation when it comes to applying to colleges. Some schools, especially those endowed with lots of money, do not take immigration status into consideration when giving out financial aid. For example, Harvard and Yale are free for income qualifying students/families, regardless of immigration status. Call the Financial Aid office and speak to a counselor about the your options. Apply to schools with scholarship programs that will cover full/most tuition without regard to immigration status. For example, CUNY has Macaulay Honors College. Hampshire College just opened a scholarship specifically for immigrant students. Do not aim low, aim high. For the most part, those schools with most endowment will offer financial aid to the most students. Do not give up your dreams of attending Yale or Harvard! Speak to the admissions counselors from colleges in your district and ask if they have any advice or tips for you as an undocumented student. Getting to know your counselor before you apply can put you ahead of the game. Do not give up. Be persistent. Ask questions. A film: Diverse DREAMers step out of the shadows to share their experiences, fears and aspirations as undocumented immigrants living in the United States. Gonzales outlines the challenging situations faced by undocumented students and describes the “legal paradox” in which they live, where “they have the right to a primary and secondary education and are generally allowed to go on to college, but their economic and social mobility is severely restricted due to their undocumented status.” Gonzales uses stories, arguments, and statistics to make the case for more inclusive immigration reform such as the DREAM Act. 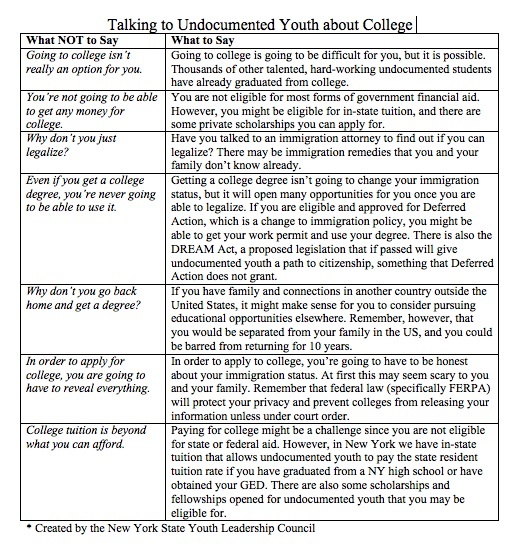 “How to Support College Bound Undocumented Students: Advice for Counselors & Educators.” Educators for Fair Consideration (E4FC). Web. 13 March 2013. This guide includes general tips on helping undocumented students apply and go to college, as well as resources (many of which are California specific) and advice related to funding for college. Patel, Leigh. Youth Held at the Border Chapter 9: The Devil You Know. New York: Teachers College Press. 2012. Leigh Patel’s book, Youth Held at the Border, was a key text for our ItAG. It provides a personal but informative look at immigration issues and how they play out in schools and in students’ lives. While the entirety of Youth Held at the Border is worth reading, this chapter focuses specifically on the challenges of and worries about the college application process and attending college that are faced by undocumented students. Pedro, William, Susana Munoz, Cynthia Alcantar, & Nancy Guarneros. “Educators Supporting Dreamers: Becoming an Undocumented Student Ally.” White Teachers / Diverse Classrooms. Ed. Julie Landsman & Chance W. Lewis. This publication describes how educators can be allies to undocumented students in a variety of ways, including during the college application process. Up-to-date as of 2012, this document includes a list of resources (by state) on college admission policies, financial aid and scholarships, and support organizations. Univision has begun a scholarship called The Es El Momento Scholarship which has been available as of October 21, 2013. The Es El Momento Scholarship will be open to all students of Latino/Hispanic heritage regardless of whether they are US citizens or undocumented. The amount awarded for each scholarship is approximately $5,000. a. Tell us about your academic/career short-term and long-term goals. How has your Hispanic heritage influenced these goals? b. Describe your participation in extracurricular activities (community service, volunteer work, employment, school clubs, sports, family, church, etc.). What have you learned from your experience(s)? c. Describe a recent academic challenge you have faced. Explain how you overcame it. If you still have questions that do not have to do with the online application, please email to Univision@hsf.net or call toll free at 1-855-356-6636. All students who have attended a New York State high school for at least two years and received a high school diploma are eligible to receive in-state tuition at a public college in New York. Students need to know that they do not need to include a social security number on their application. However, it is important for students to make sure that they are not classified as international students– who pay tuition at a much higher rate and need to provide student visas.